Fish are particularly high in omega-3 fatty acids that help protect against many diseases such as cancer, arthritis, high strokes, and heart disease. Regular consumption of fish can reduce the risk of various diseases and disorders.children who eat fish may be less likely to develop asthma and many other diseases. So try to include fish in your meals. 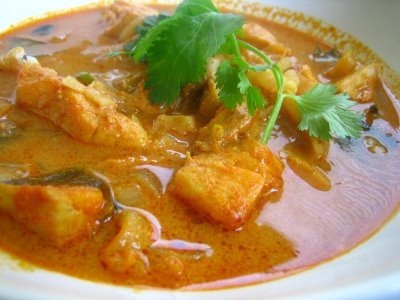 Here is a recipe for fish curry by chef Zakir. Fry the fish in a pan. In other pan heat little oil and fry the onions till they are light brown in color. Now add tomatoes and little water in it. Now grind the roasted black chickpeas and poppy seed with little water in a grinder. Add red chili, salt, all spices, chili flakes, and half cup water and cook it till it thickens. Add cumin seeds and coriander and cook for more 1-2 minutes. Now add poppy seed and chickpeas mixture and cook it for 2-3 minutes. Add 1/2 cup water cook it covered for 1-2 minutes. Add fried fish in curry and garnish it with coriander leaves and serve it with boiled or garlic rice.